The following is a guest post by Tableau enthusiast David Murphy. 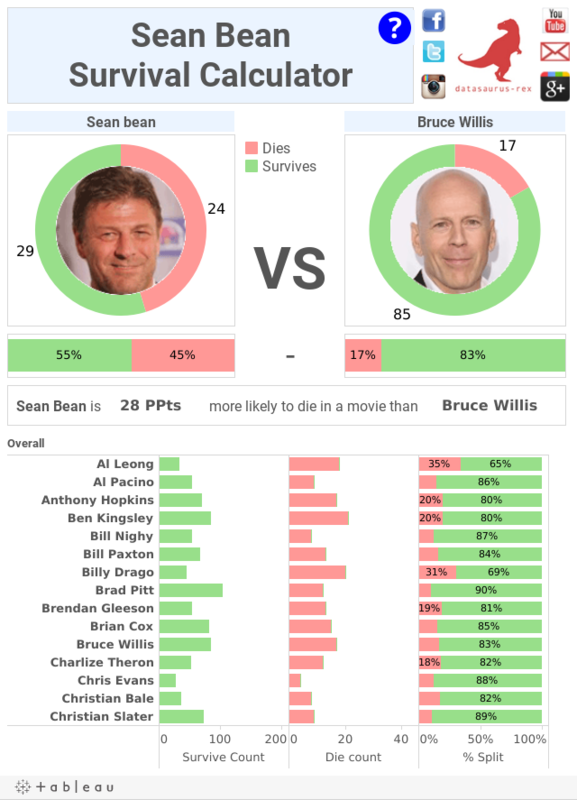 To illustrate, I’ll walk you through my latest Tableau viz, Sean Bean Survival Calculator, which I made because I wanted to know if the Sean Bean meme was justified. The data I found was just a written list—OK if you’re a human reading it, but not ideal for Tableau. Computer says no. First, I defined the dimensions and measures I would need. Dimensions: Categorization fields like actor name, gender, and movie. Measures: Quantitative fields to count, like total films, films died, films survived, and survival rate. Next I realized I had a problem. I had manually sourced the total number of films each actor has starred in. This was easy, as it’s just a raw number. But I needed to count the number of films in which each actor’s character died, using a different data source. The data was a written list, including actor name, and then a list of the films the actor died in. I had this information for 102 actors and did not want to manually count each film! I noticed a pattern. The film names were separated by quote marks and commas. With a simple spreadsheet formula, I was able to achieve my goal. Oops—nearly forgot the "and" in that list! So I added "+1" at the end of the equation. And that’s your logic. It took me one minute to get the death count for all the actors. There was less risk of human error, too. Before committing to complete the database, I tested four to five rows of sample data in Tableau. Protip: You can simply copy and paste your data straight into Tableau. I made sure my data would enable the kind of visualisations I wanted. This lets me spot gaps—for example, if I’m missing a crucial field—or opportunities—get inspired to add something extra which could improve my story. There you have it—three simple tricks to keep your data machine-readable, so you have more time to focus on discovering the insights within. For more tips, ideas, and vizzes by David, check out his Tableau Public page and his website, Datasaurus-Rex. You can also connect with him on Twitter @datasaurus_rex. I like the idea and information but the viz itself is misleading. Survive count and Die count have different axis ranges, often leading to the Die count looking much higher than the Survive count. Check out John Hurt to see what I mean. I wanna know how to make pie chart with inserting image in it. The band around image.